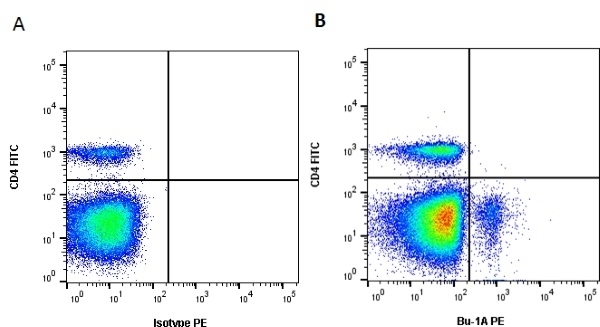 Figure A. FITC conjugated Mouse anti Chicken CD4 (MCA2164F) and RPE conjugated Mouse IgG1 isotype control (MCA928PE). 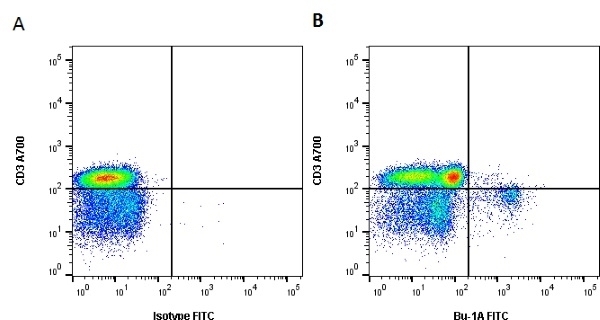 Figure B. FITC conjugated Mouse anti Chicken CD4 (MCA2164F) and RPE conjugated Mouse anti Chicken Bu-1A (MCA2170PE). All experiments performed on peripheral blood mononuclear cells extracted from whole chicken blood gated on lymphocytes in the presence of 10% chicken serum. Data acquired on the ZE5™ Cell Analyzer. Figure A. Alexa Fluor 700 conjugated Rat anti Human CD3 and RPE conjugated Mouse IgG1 isotype control (MCA928PE). Figure B. Alexa Fluor 700 conjugated Rat anti Human CD3 and RPE conjugated Mouse anti Chicken Bu-1A (MCA2170PE). 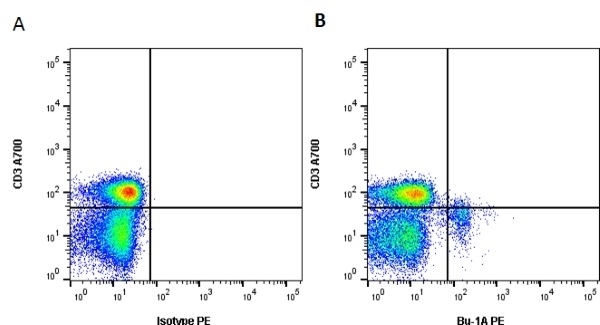 All experiments performed on peripheral blood mononuclear cells extracted from whole chicken blood gated on lymphocytes in the presence of 10% chicken serum. Data acquired on the ZE5™ Cell Analyzer. Figure A. Alexa Fluor 700 conjugated Rat anti Human CD3 and FITC conjugated Mouse IgG1 isotype control (MCA928F). Figure B. Alexa Fluor 700 conjugated Rat anti Human CD3 and FITC conjugated Mouse anti Chicken Bu-1A (MCA2170F). All experiments performed on peripheral blood mononuclear cells extracted from whole chicken blood gated on lymphocytes in the presence of 10% chicken serum. Data acquired on the ZE5™ Cell Analyzer. Mouse anti Chicken Bu-1 antibody, clone L22 (MCA2170F) used for immunofluorescence studies. 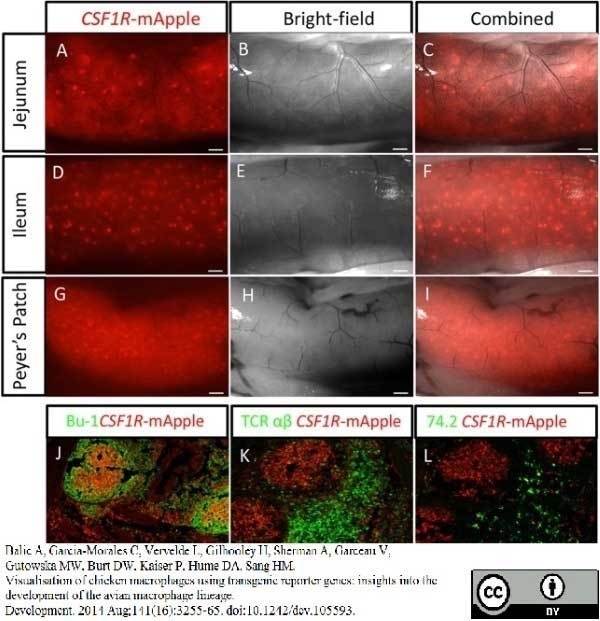 Confocal analysis of MacRed chicken post-hatch mononuclear phagocyte populations. (A) Splenic mononuclear phagocytes (red) and Bu-1+ B-cells (green) from a 16-week-old MacRed chicken. Rings of transgene-expressing cells can clearly be seen surrounding the ellipsoid (asterisk). (B) Bursa of Fabricius from an 8-day-old MacRed chicken: Bu-1+ B cells (green) show arrangement of the B-cell follicles; mononuclear phagocytes (red) are present in the medulla (M) and interfollicular region (red arrow), but not in the cortex (C) of B-cell follicles in the bursa of Fabricius. (C) Caecal tonsil B-cell follicle from a 10-week-old MacRed chicken, showing location of mononuclear phagocytes (red) and Bu-1+ B-cells (green). 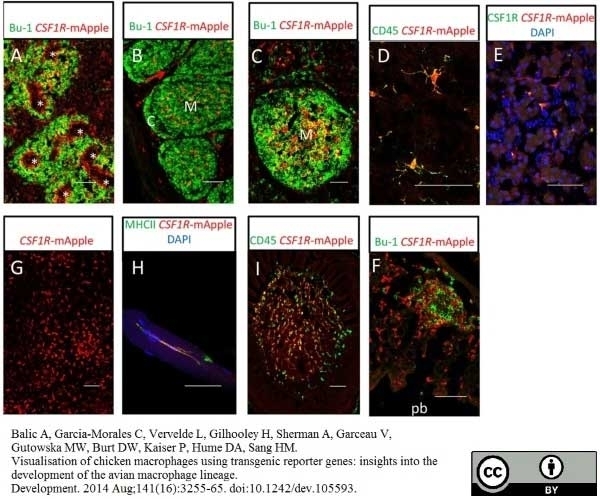 Transgene-expressing cells concentrated in the medulla region (M) of the B-cell follicle are a dense network of FDC. (D) Microglial cells (red) in the cerebellum of an 8-day-old MacRed chicken showing colocalisation with CD45 staining (green). (E) Kupffer cells (red) showing colocalisation with CSF1R (green) from a 13-week-old MacRed chicken liver. (F) Lung mononuclear phagocytes (red) and Bu-1+ B-cells (green) in the interstitial tissue of the parabronchial wall from a 16-week-old MacRed chicken. The parabronchial lumen (pb) is indicated. (G) Epidermal mononuclear phagocyte cells (red) in epidermal sheet preparation from a 10-week-old MacRed chicken. (H) Breast muscle mononuclear phagocytes (red) from a 16-week-old MacRed chicken co-expressing MHCII (green). (I) Feather pulp mononuclear phagocytes from an 8-day-old MacRed chicken (red) co-stained with CD45 (green). Scale bars: 50 μm. s patches showing organisation of CSF1R-mApple-expressing cells (red) in relation to: (J) Bu-1+ B-cells (green), (K) TCR αββ (Vβ1)+ T-cells (green) and (L) CVI-ChNL-74.2+ macrophages (green). Scale bars in J-L: 100 μm. Mouse anti Chicken Bu-1a, clone L22 recognises the 'a' allele of the polymorphic cell surface antigen Bu-1, also known as chB6. Bu-1a is a 70 kDa alloantigen expressed on B cells and a subset of macrophages. Bu-1 is expressed on B cell precursors at early stages of development (Houssaint et al. 1991). Spleen cells from immunised Balb/c mice were fused with cells of the mouse SP2/0-Ag14 myeloma cell line. Pink, J.R. & Rijnbeek, A.M. (1983) Monoclonal antibodies against chicken lymphocyte surface antigens. Houssaint, E. et al. (1989) Bu-1 antigen expression as a marker for B cell precursors in chicken embryos. Eur J Immunol. 19 (2): 239-43. Tregaskes, C.A. et al. (1996) Chicken B-cell marker chB6 (Bu-1) is a highly glycosylated protein of unique structure. Houssaint, E. et al. (1991) Early separation of B and T lymphocyte precursors in chick embryo. J Exp Med. 174: 397-406. Igyártó, B.Z. et al. (2008) Identification of the avian B-cell-specific Bu-1 alloantigen by a novel monoclonal antibody. Veromaa, T. et al. (1988) Monoclonal antibodies against chicken Bu-1a and Bu-1b alloantigens. Chaussé, A.M. et al. (2014) Susceptibility to Salmonella carrier-state: a possible Th2 response in susceptible chicks. Vet Immunol Immunopathol. 159: 16-28. Luna-Acosta, J.L. et al. (2015) Direct antiapoptotic effects of growth hormone are mediated by PI3K/AKT pathway in the chicken bursa of Fabricius. Gen Comp Endocrinol. pii: S0016-6480(15)00204-X. Jarosz, Ł. et al. (2016) The effect of feed supplementation with zinc chelate and zinc sulphate on selected humoral and cell-mediated immune parameters and cytokine concentration in broiler chickens. Res Vet Sci. 112: 59-65. Smialek, M. et al. (2017) Immunological aspects of the efficiency of protectotype vaccination strategy against chicken infectious bronchitis. BMC Vet Res. 13 (1): 44.